Pupils from across Cookstown District made their voices heard at the local heats of ENVIRONMENTAL YOUTH SPEAK 2015. Debating current issues, the students impressed a panel of judges with their knowledge in a bid to get through to the regional finals. Matthew McCann from Holy Trinity Primary School won the junior section, while Joyce Allen from Cookstown High School scooped first place in the senior section. 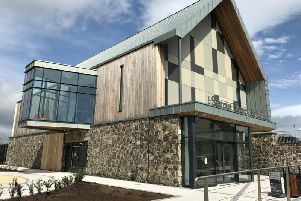 The aim of the competition was to get young people to research and debate environmental issues and the local heats took place on 25 February at Cookstown District Councils Chamber. The topics this year were, for the Junior section, ‘A Day in the Life of a Waste Super Hero’ and for the Senior section, ‘Food Glorious Food, Why Waste it?’. Both explored the environmental, economic and social costs of our food waste andd pupils from schools throughout the area took part. In the junior section there were pupils from Phoenix Integrated PS, Orritor PS, Moneymore PS, Donaghey PS, Cookstown PS, Holy Trinity PS and St. Joseph’s PS Killeenan. Schools taking part in the senior section were Cookstown High School and Holy Trinity College. The junior and senior finalists will go on to represent the borough at the regional finals, to be held at the Island Civic Centre, Lisburn on March 10, 2015. They will have to debate it out to win prizes for themselves and their schools, and lay claim to the perpetual trophy as overall NI winner. Karen Brown, Recycling Officer for Cookstown district Council said: “I commend all of the young people who took part in Environmental Youth Speak 2015. “They, and their families and schools who have supported them, have put a great deal of effort into researching these waste management issues. “They have brought forward innovative solutions to the environmental problems we are facing.